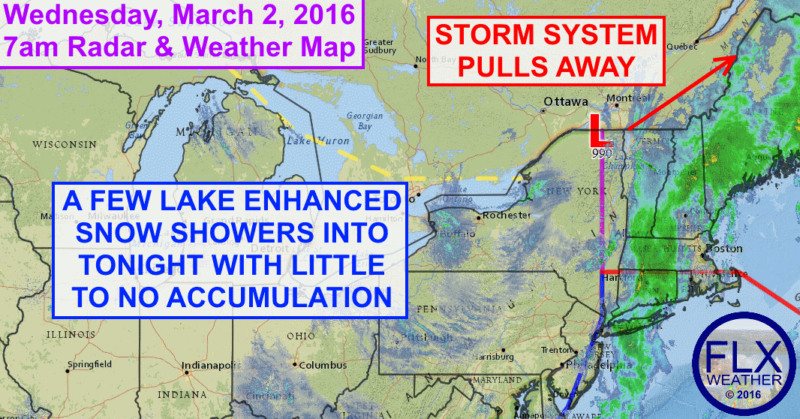 Cold air streaming in behind low pressure will produce some lake enhanced snow showers today and tonight. Low pressure moved across the Finger Lakes last night. Most areas saw just rain from this system, but parts of the western Finger Lakes saw some icy precipitation. There is very little in the way of precipitation behind this system. However, the cold air circulating into the Finger Lakes behind the low pressure is producing some lake enhanced snow showers. These flurries will continue this morning, but should die off a bit for the afternoon before a few more develop overnight. Accumulations will generally be no more than a coating, expect perhaps for areas right near the Great Lakes, where an inch or two may fall. Temperatures will remain fairly steady today in the low and mid 20s as incoming cold air counteracts any daytime heating. Any lake effect that develops tonight will likewise be light. The most favored areas are across the northern Finger Lakes and into the eastern Finger Lakes. Overnight lows will be in the teens. Most of Thursday and Friday will be quiet. A few flurries may spread across the southern parts of the region early Friday, but with no accumulation expected. Temperatures will slowly moderate, but will remain below normal with upper 20s Thursday and low 30s Friday. The weekend looks quiet with normal temperatures in the upper 30s and low 40s. A major warm up is expected for next week, with 60s and even 70s possible starting Tuesday.